Joining up with Jenna for all the fun. I'm sure by now that you've seen the capsule wardrobe craze that's sweeping the blogosphere. If you haven't this is the general gist of it. Basically, you select a slim number of clothes (30-40 range) and only wear that number per season. The rest you donate, sell, throw away, turn into a rug (just kidding, except that that's actually a pretty great idea), etc. 1. What a novel concept! I'm definitely going to do that! 2. That's crazy. I could never live with that small an amount of clothing! 3. Ummm...I already do that. In fact, I'd have to buy clothes to reach the 30-40 mark. I'm coming at this as someone who once would have been a #2 and now is closer to a #3 (not quite, but my wardrobe is pretty slim). I made that transition years before the capsule wardrobe craze, and it was definitely a work of grace in my life. 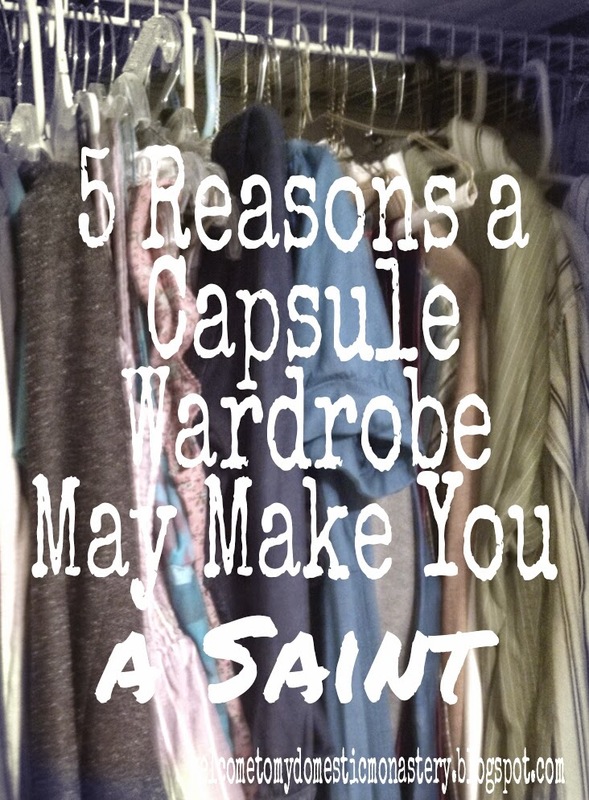 With the right mindset, a capsule wardrobe mindset can be a step on the journey to sainthood. 1. It affords you the opportunity to be generous. I'm writing this on the feast of St. Martin of Tours. Do you know him? Do you know his story? The story goes that one day Martin, who was a soldier at the time, encountered a beggar. He cut his thick cloak in half and gave half to the beggar, to keep him warm. That night, he had a dream in which he saw Christ wearing the cloak and showing it off to all the saints. The beggar had been Christ. I think that there's a danger in viewing those who are "less fortunate" as being other. I remember once, when I was in middle school, we were shopping in a thrift store for something we could use to make a Halloween costume. It was the first time I was even in a thrift store, and I remember laughing about how silly some of the old clothes looked. My mom stopped me and reminded me, "You know, some people have to shop here, Michele, because they can't afford to go anywhere else." And that stuck with me. We weren't wealthy when I was growing up, but we certainly never had to go shopping at thrift stores. Fast forward fifteen years or so, and I'm married to a graduate student, staying home with our daughters, living in a post-recession economy and...well...I shop at thrift stores. Regularly. And not just for fun. (Although, nowadays it's considered kind of trendy to thrift, so that does make it more fun.) Our budget is tight, and I have to get creative to make it stretch. But the point is this...I didn't drastically change in the last fifteen years. (Well, other than getting older and hopefully more mature.) I still possess the same dignity. It used to be that when I sorted through my clothes and decided what to give away, I typically would only give away what was old and worn-out. Since becoming a single income family, and sometimes needing to go to a thrift store to find clothes, my mentality has changed. If I don't need something - even if it's in great shape - I pass it on. It used to be hard for me to let go of things, but now I think of the person who may be the recipient of it, and it makes me happy to know that what was stashed in the back corners of my closet might be worn and loved by someone else - the way that my favorite thrift store finds and hand me downs are worn by me! Oh, and just a note...if you have clothes to get rid of, consider donate them to St. Vincent de Paul (especially the really nice ones!) instead of selling them. Your reward in heaven will outlast any cash a consignment store will give you for them! 2. It helps promote a spirit of detachment. I struggle alot with materialism. I'm always wanting things and I'm guessing that more than a few of you find yourselves struggling with the same sort of thing. We live in a society where "he who dies with the most toys wins" and it can be hard to fight that mindset. But things are just...things. Clothes are for wearing, food is for eating, furniture is for sitting on, books are for reading, phones are for talking. Things are just things. They each have a purpose, a place in the general order of the world. And, if those things step outside of that order, well...then they aren't serving their purpose anymore, and it's time to let them go. I used to hold on to certain clothes because of memories, or because I liked how it looked, but now I realize...clothes are just clothes. You only need so many clothes. You don't need as many clothes as you think! You only need the clothes you actually wear on a regular basis. As hard as it is to let go of some of the other clothes, it is also freeing. One day, we will have to let go of everything, and each step toward heaven should be practice for that great "letting go." Purging your wardrobe? A good step in the right direction. 3. It forces you to trust in God's providence. How many times have you held on to something because, "Maybe I'll fit it again!" or "Maybe that will come back in style someday!" or "You never know if you'll need it!" We think we need to have everything planned for, everything figured out, but we don't. Consider the birds, and all that. God clothes them, and He will certainly clothe us. The funny thing is...it's true. Since I've been letting go of clothes that I don't actually wear, I've been surprised by the many beautiful ways that God has provided for me and our family. I've traded clothes with friends, learned how to sew and re-fashion garments, been gifts with some generous gift cards, etc. etc. God truly does provide, and if we cling so desperately to what we think we need, then we're essentially telling God, "No, thanks. It's okay. I've got it. I don't need you." Friends, that's a little thing we call pride. I'm offender #1 in that area most days, trying so desperately to be self-sufficient. But God is perfectly capable of providing for us, if we'll only let go. 4. It enables you to practice mortification. I'm guessing that when most of you think of mortification, a pretty nasty image comes to mind - stones in shoes and hair shirts and the like. But mortification isn't that; it's denying yourself little trivial things, in order to remind yourself that there's something more important than creature comforts. Everything is a gift, and we aren't entitled to perfect comfort. That's something I'm struggling with a lot lately, especially when dealing with two screaming children before 6:00 a.m. All I can think in those moments is, "Why me, God?! What did I do to deserve this! Poor me!" But do you know what? I don't have a right to sleep in until 6:00 or - heaven forbid! - 7:00 in the morning. If I get to get some good sleep, praise God! If not, well...it's something to offer up. It's a reminder that there are more important things than sleep in this life (and one look at the faces of the two stinkers who are waking me up reminds me that). It's the same way with clothing. I love cute clothes as much as the next girl. I have my own sense of style, and I like looking put together. Don't hate me, please, but I actually do get dressed up most every day, just because it's fun for me to do. But do you know what hits me like a ton of bricks? Being sick. 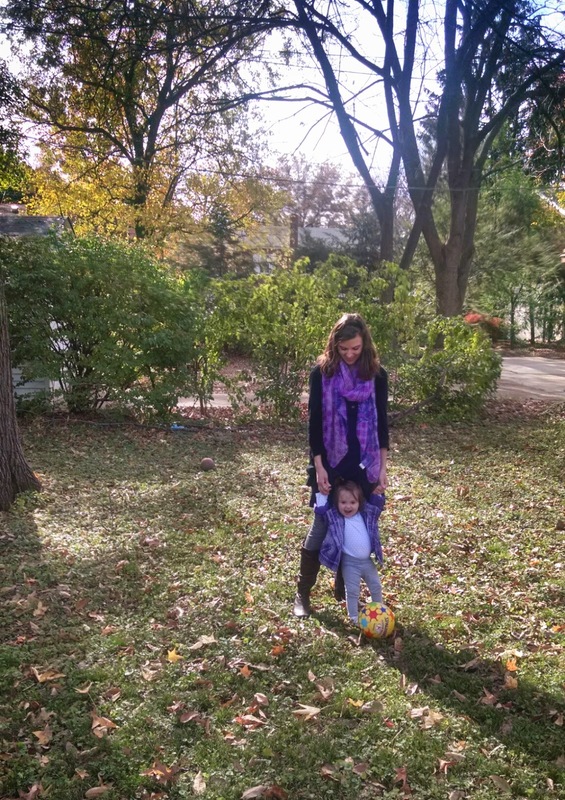 Pregnancy, kidney stones...I've had times when I was so sick and bedridden that I couldn't shower or change my pjs for days, and I would finally have to do something when I started feeling like I smelled. (I wish I were kidding, but hyperemesis gravidarum is a beast). So trust me...it all evens out. I can't always wear those clothes that I'd like to wear, and some styles and sizes I've had to give up permanently. But having to let go of looking perfect...it is a good thing. Because in this world, there is no such thing as perfection (other than Mary and Jesus) and it's good to have to let go of that when I let go of clothes that will never fit me again. If I'm focusing on having a perfect body, I'm missing the point of life. 5. It makes space for others in your life. Our family has been on a Sunday afternoon/evening HGTV kick (now that "Property Brothers" is on Netflix) and something that strikes me over and over again is how big people's closets are. And if someone buys a house with a "small" closet (that is about 5 times the size of our closet) then the first thing they want to do is make that closet bigger! And, sad to say, the main culprit is the wife/mama of the family. It seems to be excepted that the woman of the family has a ton of clothes, and of course she needs a big closet to accommodate them! But do you know who gets pushed to the side? Her poor husband. It's as if his needs don't matter, and he's relegated to a tiny corner of the closet. When we first got married, I definitely had more clothes than Andrew. Now, we take up about the same amount of storage space in the closet and drawers combined (I think I have an extra drawer, but he has extra space in the closet). And it feels equal. It feels like he has a home for his things, and it makes our room feel truly shared. It's something so small, but being mindful of the need to limit my things to an equal sharing of space in our room turns the focus to being a good steward of my space. And let's be honest...I love that guy that I'm married to. I want him to have space for his things, and our closet is so darn small, that I have to be mindful of how much space I'm taking up!! Just found you through 5 Faves at Call Her Happy. Your writing is a pleasure to read. I would add, just from my experience of getting rid of a lot of my things recently, that it is a big blessing to free up the mental energy that is expended on finding the good clothes in a heap of ones that don't work. I gave away or threw out anything that didn't look good on me, boxed up my pre-partum clothes that I am a few pounds away from wearing (but have been working toward FOREVER), and now my closet has just stuff that I can pull on without worry. Once I did this, it helped me see what was missing, and it wasn't as much as I had assumed. I've bought a handful of things, and now for the first time in my life, dressing up to go out is not a stressor. 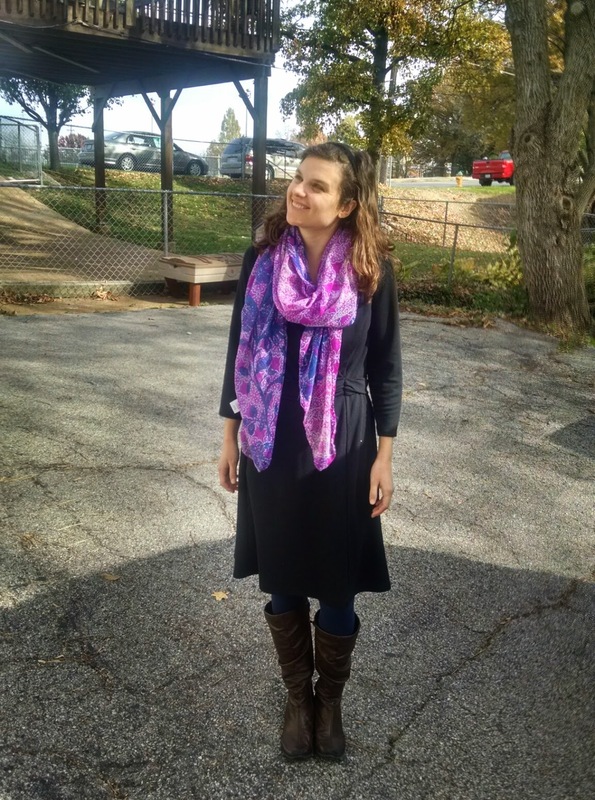 It lets me spend less time thinking about what to wear/how I look.